Listening back to it now, I realise the theme to Just So Stories is the same as that used for the closing music in series two of A Bit of Fry and Laurie (although it appears here in fully-orchestrated, and yet somehow slightly less impressive, form). The Stilgoe’s On theme features not one, not two but three Stilgoes harmonising with each other. It’s an acutely fussy song for a rather humble chilren’s programme about making things, but that just renders it all the more memorable. 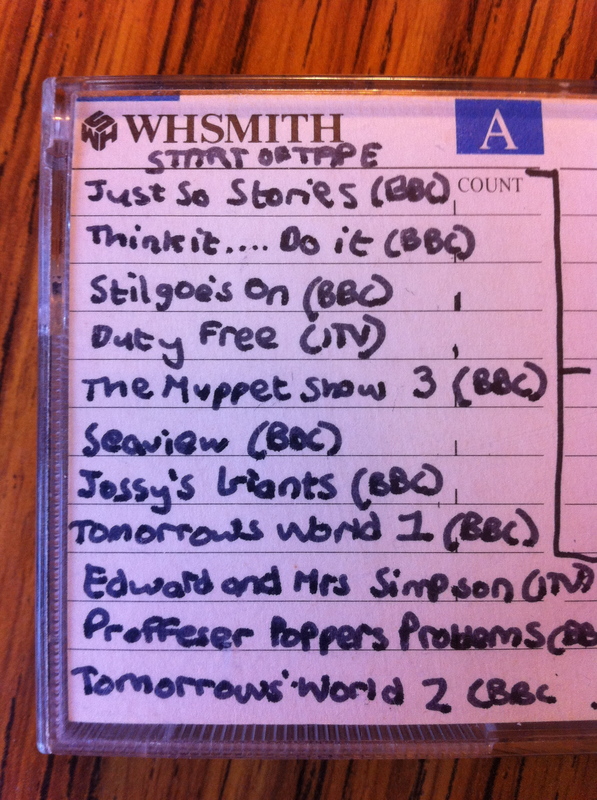 I think Edward and Mrs Simpson is on there because my mum liked it. It’s not the sort of thing I would’ve willingly watched in the spring of 1986. Or perhaps any season. Ever. Seaview, meanwhile, is an ambitious edit of the opening (ordinary) and closing (full rock wig-out) versions. I didn’t go about these things lightly. I’ve said this before, but I am truly glad this and the other tapes still exist and are still playable. As such I readily doff a Jossy’s Giants goalmouth-sized hat in the direction of the fine folk at WHSmith. …Did Project and Measurement today. Took some Project home to do. All at No 20 was a Maureen Lipman-helmed sitcom which, it being a Monday night and starring Maureen Lipman, was made by Thames Television. It being a Maureen Lipman sitcom, it also boasted a theme tune performed by Maureen Lipman, although unlike her previous effort for ITV there was no singing involved, just some inoffensive, must-try-harder scatting and doobedooing. The entire sit and com of All at No 20 is conveniently, if not entirely painlessly, demonstrated in this 10-minute selection of clips, featuring Maureen in a variety of fetching mid-80s I’m-an-independent-woman outfits (topped off with oversized glasses), along with randy bank manager Gary Waldhorn, lippy daughter Lisa Jacobs, Martin Clunes in a bowtie, a gag about the Trade Descriptions Act, someone pretending to be gay, a bare minimum of about three studio sets, and a Bittersweet Twist At The End. 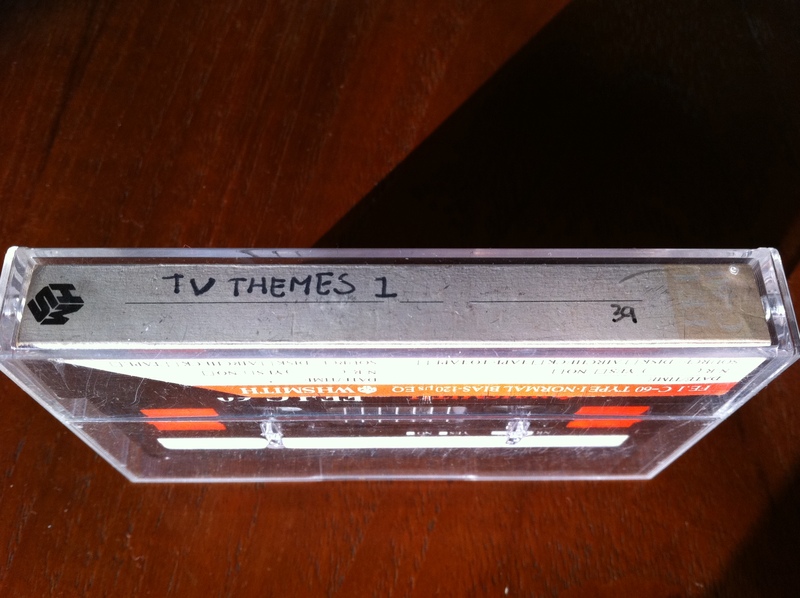 …Recorded three theme tunes today. Watched a Miss Marple adventure. My home taping efforts were clearly picking up pace, perhaps because I could see I was nearing the end of the cassette and was keen to feel a sense of achievement at having filled a full hour of WHSmith FE.I C-60. Going off the inlay card, the three themes in question must have been Brat Farrar (*shudder*), Hancock’s Half Hour (never really a fan; I just liked the way he went “H-H-H-H-H-Hancock’s Half Hour”) and the sublime Miss Marple. I say sublime, but one of the Beeb’s Miss Marple adaptations gave me nightmares. It was The Body in the Library. I’m not sure when I saw it, as that particular episode was first screened over Christmas 1984, when I doubt I’d have been allowed (or really wanted) to watch such classy capers. I’m guessing it was a repeat screening that gave me the creeps. It was a proper full-on shouting-out nightmare to boot. All precise details have long vanished from memory, but I’m vaguely convinced that it might have been triggered by the bit where a body is found not in the library but in a burned-out car. Alternatively, [looks at cast list] Valentine Dyall may have been involved. I’m pretty sure it did not involve the titular totterer. Unless I’m losing my Marples. I’ve an especially vivid recollection of this. As usual, I was waiting by the television with a portable cassette recorder held as close to the set’s speaker as possible. But on this occasion I was caught a little off-guard, as rather than the show being introduced in the standard manner by the BBC continuity announcer over a graphic of a spinning globe, the episode was cued in by Terry Wogan from the set of his chat show. I’m not sure if this was the first episode of a new series of Dallas, but Tel definitely had at least one cast member from the show with him in the studio. As the interview came to an end, deploying his usual mix of blarney and bemusement Terence thanked his guests, thanked his audience and thanked us for watching, then made as if to settle back and “watch” Dallas on a giant screen positioned just behind his left shoulder. The episode duly began there and then, in the Wogan studio. I panicked. Scrambling to press record, I missed the opening seconds of the theme in the process. Just as I got the tape up and running, the picture on our TV set crossfaded from the image of Dallas in Wogan’s lair to your standard full-screen Dallas transmission. It was all a bit of a kerfuffle, but I must have been satisfied enough with the results to not bother trying again the following week. 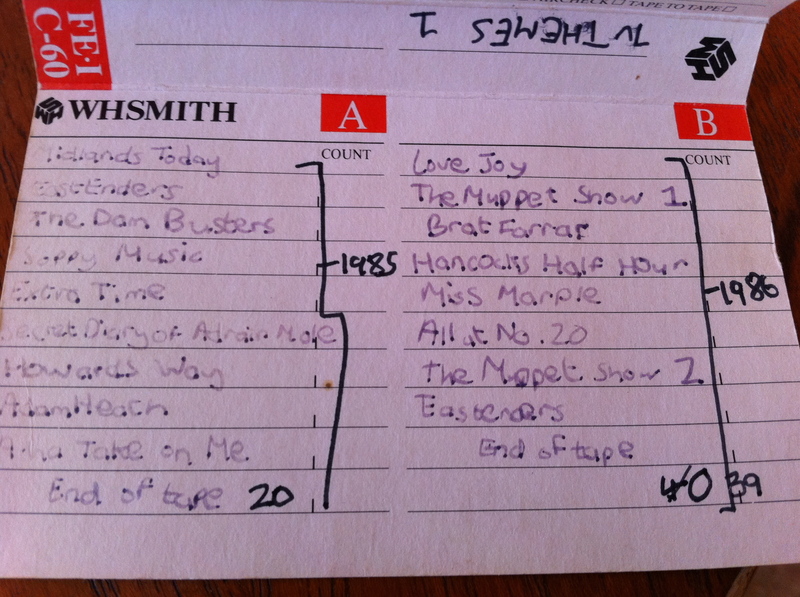 The inlay card of the cassette on to which I was putting all these themes lists Lovejoy as the track after Dallas, followed by The Muppet Show (which my diary notes me taping on Saturday 8 March). I should add that neither I nor my family ever really watched Dallas. This would’ve been one of those occasions where I recorded the signature tune because it was first and foremost A Good Theme, not good television. Unlike Lovejoy and The Muppet Show, which were and are, by any measure, Good.